When Kenny, a Scot with an impressive mountaineering background, called to ask what sort of thing would be possible to do in the Alps in winter on snowshoes, it was a tricky one to answer. He was coming with his girlfriend Rhona, an experienced winter walker and novice alpinist. They wanted to do something a bit more than a normal snowshoe walk that would be a challenge for Rhona!In the Alps most as the approaches and descents are long and snowy and it is much more efficient and quicker to move on skis than anything else! There is also the added pressure of needing to be off the mountains and safely back down the valley before the day heats up too much, increasing the risk of avalanche and rockfall, so the days are extra short! In winter the conditions in the high mountains can be very unpredictable; there could be deep powder in which case walking in snowshoes is just simply too exhausting to get anywhere far, it can be icy, in which case crampons would be better, there can be high winds, high avalanche risk and severely cold temperatures. Snowshoes are very limiting as they are not really adapted to steep slopes or very icy conditions so as soon as you leave the lower mountain trails you can be quickly in difficulty!Unfortunately neither Rhona or Kenny had ever put a pair of skis on in their lives so snowshoes, ice axes and crampons were to be the only tools for the trip! So the answer was a really very vague, "it basically depends on the weather but there are a lot of factors against you!" kind of answer! After explaining all this, I really expected them not to bother booking and maybe to come back in the summer. But no, Kenny's enthusiasm for the mountains was over-riding - the summer was too long to wait for an alpine fix. They booked for March with two days private guiding and a 'we'll wait and see what the conditions are like and take it from there" attitude.March finally arrived and after a very poor snow year and warm temperatures, the mountains were looking pretty snow depleted, even at 2- 3000 metres! In addition, after each snowfall this year there had been high winds so the ridges were blowdried! But actually, though less good for skiers, for Kenny and Rhona this was great. It reduced the deep snow problem and though slushy soft snow and avalanche risk was still potentially an issue in certain places, this would be easier to manage by choosing our mountains carefully! 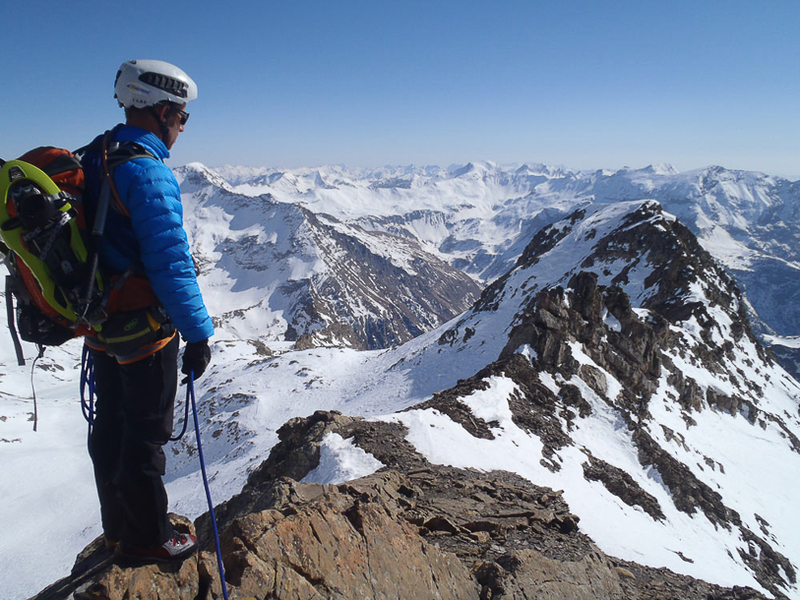 After an initial day climbing the Petite Autane a pretty mountain with a dramatic limestone ridge, then a walk up to the summit and a snowshoe down snowfields Bernard decided to go for the Roc Diolon 3066m. We got the ski lift up to 2200m in the resort of Orcieres 1850 - a big save on time and ascent energy. Then we walked up on the pistes towards the col- not very wild but an easy walk up!Then we harnessed up, put on our crampons and roped up to attack a fabulous little gully that would take us up to the ridge. The gradient started off at about 40 degrees and the snow was hard enough not to sink in but soft enough to get a good grip and we cramponed up. Then came the descent, a large steep snow field. The pressure was on as we had just 21/2 hours to get back to the ski lift and avoid a very long walk down. It was also heating up and this was a south west face prone to avalanches and rock fall. The snow was soft on the top but still well hardened underneath and was perfect for walking down duck style with heels in. No crampons needed but a few ice axe arrests were made! It was a relief to get to the bottom and the relative safety of the ski resort! Though Bernard reminded us that even in a ski resort there are dangers as he described how an avlanche from a seemingly small and innocent looking hillock nearly swept out a group of army officers and covered a piste in recent years.Just as we neared the piste, we stopped to remove a layer and were given a reality danger check as the mountain above us released several rocks that hurtled down and could have done serious damage! Have a look at their photo album . We quickened the pace and managed to catch the telecabin down for an easy finish to the day and a well deserved drink in Orcieres! 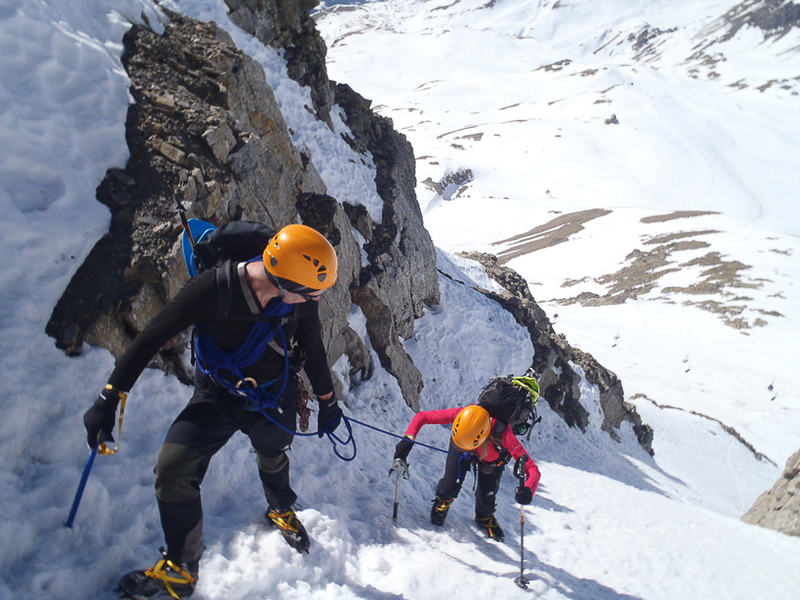 It really was a great mountaineering initiation: climbing a gully in ice axe and crampons, moving together on a rope over a steep and exposed ridge and descending a snowfield using the ice axe for protection and experiencing the safety time pressure dictated by the conditions! A very lucky day for conditions in March and a big thank you to Kenny and Rhona for choosing to share their mountaineering enthusiasm with us! 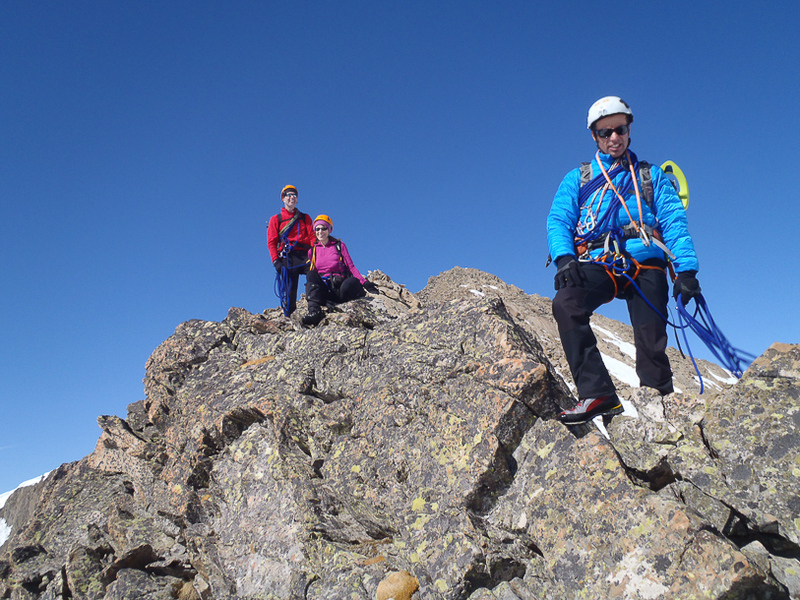 If you would like to debut in mountaineering, have a look at our introductory mountaineering trip in June.